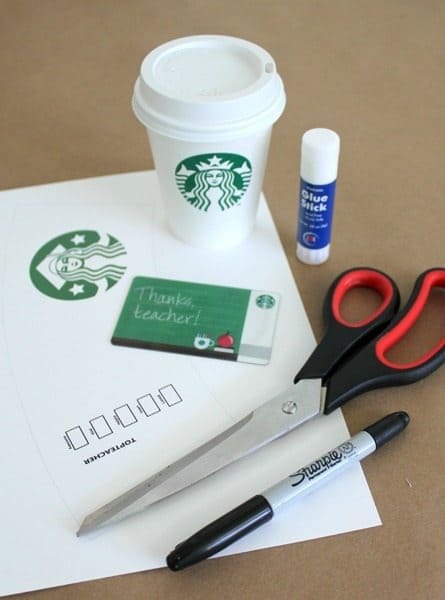 Here’s a quick and easy printable for you to customize as an end of year Starbucks gift card* thank you for all the top teachers out there to show your appreciation. 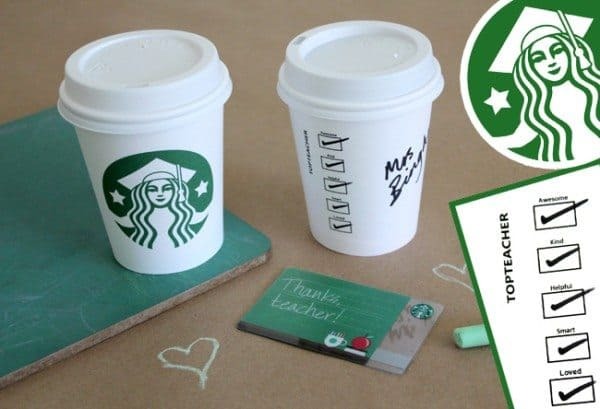 My kids’ teachers love their coffee and the two of them used to go get each other cups of Starbucks coffee on their lunch breaks, so a Starbucks gift cards seemed like the ideal thank you present for them. 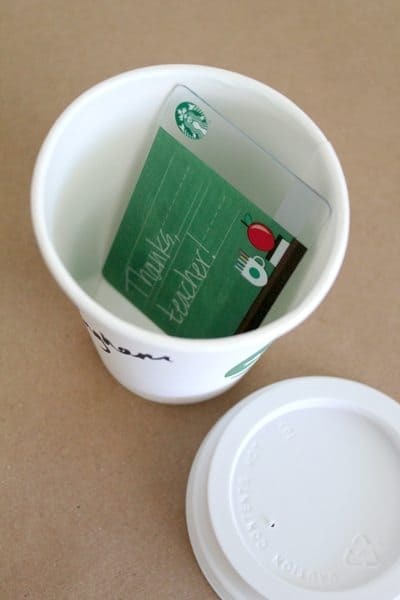 This cheeky little printable “Thank You Teacher Sleeve” fits over one of the smaller Starbucks take out cups (the size they usually do the kid’s hot chocolates in), which is also the perfect size to hide the gift card inside. 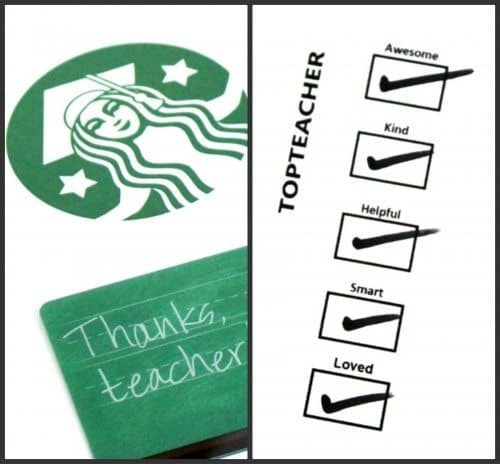 Starbucks is even doing “Thank you Teacher” printed gift cards at the moment, so I’m guessing it’s official teacher fuel or something. 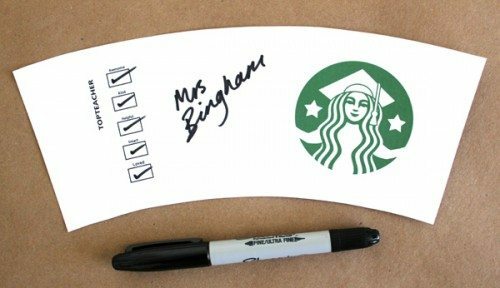 In our Thank You Teacher Sleeve, the Starbucks mermaid has traded her tails for a graduation cap and we’ve replaced the usual check boxes for decaf, etc with check boxes for top teacher qualities. 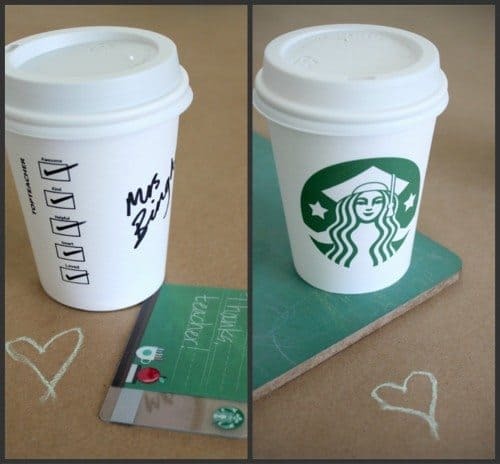 All you need to do is download, print , cut it out and glue it onto a take out cup. The staff at our local Starbucks were more than happy to give me a couple of empty cups to put the gift cards that I was buying into. Click here to download the Thank You Teacher Sleeve printable PDF and use a black marker to tick your boxes and write your teacher’s name on the side (barista style). Our teachers do such a valuable job. I hope that these will give them a giggle with their much deserved gift cards and our thanks. * Note: Starbucks, we love you and this printable was made to help parents as they creatively wrap up the Starbucks gift cards they give to teachers as thank you gifts (which is a good thing, right?). If you’re unhappy, please contact us and we’ll take it down ASAP. Lindsey Boardman loves to share the messy art and crafting fun projects she concocts with the help of her two young daughters, her “filth wizards.” She documents this fun on her personal blog Filth Wizardry. What a FUN idea. I wish I had this when we did Teacher Appreciation week. We gave our teacher and teacher’s aid one of those teacher gift cards. LOVE it. Next year Alyssa– this will hopefully stay in our archives. Or, for your year-end gifts. Thank you for sharing. Awesome idea. Great & convenient way to present a gift card – thank you for sharing! I love this! I printed two of them, one for each teacher – thanks for the idea. very creative. Thanks for sharing! I just printed some for end of year gifts and I plan to turn the cup to a small pot (maybe with a cactus) for my beloved teachers to keep on their desks! Thanks for sharing the template!!!!! I see the downloads for the Starbucks sleeve with the graduation cap, but don’t see the one pictured in top photo with the crown. Is that one still available? this craft (cup sleeve) is meant as a teacher/graduation gift thus it was made with the graduation cap. We never made a sleeve with the crown on the mermaid. Great teacher’s appreciation sleeve. Is there a way to change teacher to aid or another title? Unfortunately not. Sorry, we just don’t have the people resources to edit these for personalization of titles. Can you share the image? The image can be edited. The image is available for download from our website for personal use only by following the links. I found the pdf file; are you saying you have a .jpg, .gif, or .png file available for download? Happy that you found it. Only the PDF file is available.